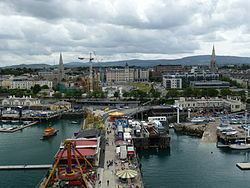 Dún Laoghaire ([d̪ˠuːn̪ˠ ˈɫeːrʲə]) is a suburban seaside town in County Dublin, Ireland, about 12 km (7.5 miles) south of Dublin city centre. Formerly a major port of entry from Britain, from 1821 to 1920 it was named Kingstown. The town's name means "fort of Laoghaire". This refers to Lóegaire mac Néill (modern spelling: Laoghaire Mac Néill), a 5th century High King of Ireland, who chose the site as a sea base from which to carry out raids on Britain and Gaul. Traces of fortifications from that time have been found on the coast, and some of the stone is kept in the Maritime Museum. The name is sometimes unofficially spelt in modern Irish orthography as Dún Laoire or Dún Laoighre. In some cases, the old anglicised spelling Dunleary /dʌnˈlɪəri/ is seen. This is also how the town's name is commonly pronounced. Dún Laoghaire dates from the 1820s. An earlier Dún Laoghaire village was around the area where the Purty Kitchen pub is now (sometimes mapped as "Old Dunleary"). Dún Laoghaire had a coffee house and a small cove, both of which are shown on a number of old maps, and it may have had a salt mine (Salthill is close by). At that time, the area was a craggy, rocky pasture with some quarries. Around 1800, some maps show a small town centre along what is now Cumberland Street, close to the junction with York Road. On the night of 18-19 November 1807, two troopships, the Prince of Wales, and the Rochdale, which had departed from Dublin, were driven on the rocks between Blackrock and Dún Laoghaire with the loss of over 400 lives. This disaster gave new impetus to an existing campaign for a harbour to be constructed near Dublin. By 1816, the legislation was passed authorising the construction of what is now called the "West Pier". The lines of the current town centre including George's Street and most adjoining streets are clearly shown on maps prepared for the development of the harbour, and in particular on a John Rennie plan of 1817, when construction of that town centre had barely commenced at the western end of George's Street. That street may originally have been laid out as a military road connecting the Dún Laoghaire Martello Towers—one at the Peoples Park, the other near the end of the West Pier—both of which have long disappeared. Whatever its origins, the street was clearly an engineer's design, being ruler-straight for all of its length (except the small western part which clearly pre-dates 1816). When King George IV came to visit the new port under construction in 1821, the name Dunleary was dropped in favour of "Kingstown"; the town returned to its former name in 1920, in the lead-up to the creation of the Irish Free State. By the time the Ordnance Survey was completed around 1845, the maps show buildings on much of the street and adjacent streets. 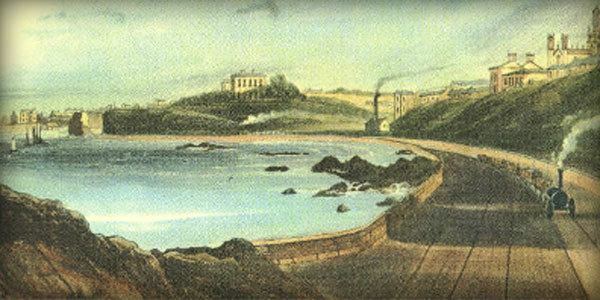 Ireland's first railway from Dublin to Kingstown, opened in 1834, terminated near the West Pier. 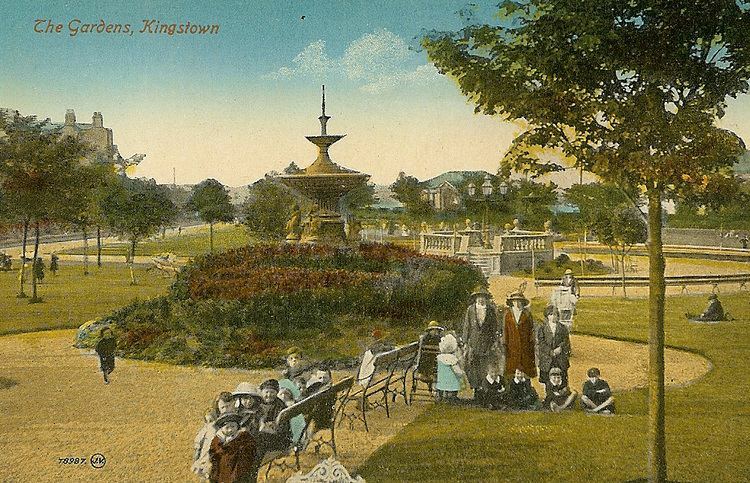 It established Kingstown as a preferred suburb of Dublin, and led to the construction of elegant residential terraces. By 1844 the Atmospheric Train (designed by Robert Mallet) connected Kingstown to Dalkey, leading to further development. The Atmospheric Train ceased in 1854, but was replaced by the extension of the railway, which was subsequently extended to the ferry port of Rosslare. The opening of the railway from Dublin saw Kingstown become a Victorian era seaside resort. The main road to Dublin, through Monkstown village and Blackrock, was the sole road connection to the city of Dublin until 1932. In that year, the Eucharistic Congress brought thousands of visitors to Dublin, and plans indicated that most of them would come through Dún Laoghaire. The road was considered inadequate, and a new coast road was created by connecting some short segments of road and closing some gardens. This road is now Seapoint Avenue. An agreement with the local residents to restore the area to pre-Congress condition was never fulfilled. The British 59th (2nd North Midland) Division disembarked at Kingstown in April 1916 and marched up the road to Dublin, to participate in the Easter Rising. Adjacent to the Carlisle Pier and overlooked by the National Maritime Museum of Ireland, there is an anchor, recovered from the wreck of the mailboat RMS Leinster which was torpedoed over the Kish Bank in 1918, with the loss of over 500 lives. Dún Laoghaire was hit by stray German bombs during the Second World War, a couple of bombs landing near the People's Park at Rosmeen Gardens. Damage from the bombs was limited to buildings. For elections to Dáil Éireann the town is part of the Dún Laoghaire constituency which is currently represented by four TDs; two from Fine Gael and one from the Labour Party and PBPA. The former Tánaiste, Eamonn Gilmore, who resides in Shankill to the south, was one of the TDs from the constituency between 1989 and 2016. The harbour, one of the largest in the country, is notable for its two granite piers. The East Pier is particularly popular with walkers, and was featured in the 1996 film Michael Collins, where Liam Neeson (as Collins) and two of his co-stars are seen walking along a seaside promenade, which is actually the Dún Laoghaire East Pier. A band is seen playing on a bandstand in this film scene, and this is the actual bandstand on the East Pier. The bandstand was restored to its original condition in 2010 by the Dún Laoghaire Harbour Company. A lighthouse was at the end of the East Pier, while the new headquarters of the Commissioners of Irish Lights (the General Lighthouse Authority for Ireland) is on Harbour Road. South of the harbour is Scotsman's Bay, where there was a Victorian seaside amusement area, with walks, shelters and baths. The walks and shelters are largely intact. Dún Laoghaire Baths have been derelict for many years, but were repainted in bright colours in 2012. Plans for restoration of this area are much debated, and some of the more ambitious ideas have been highly controversial. A new library has been built to cater for education purposes and also to increase tourism in the area. this library was built newly in 2014. Dún Laoghaire is connected to central Dublin by the DART suburban railway, and is also a stop on the mainline rail service from Dublin to Wexford and Rosslare. The town is also served by a frequent bus service e.g. 7, 7a, 45a, 46a, 59, 63, 75, and 111. Beside the railway station is the terminus of the 63, 75 and the 46a, the most frequent and heavily used bus route in Dublin. The 746 bus route from the station terminus to Dublin Airport was discontinued in October 2010. Sandycove and Glasthule and Salthill and Monkstown also serve the area. An Aircoach service links the area with Dublin Airport 24 hours a day with stops at County Hall and the Royal Marine Hotel. Route 703 travels from Killiney to Dublin Airport via Dalkey, Glasthule, Dún Laoghaire, Monkstown, Blackrock, Booterstown, Tara Towers hotel, Strand Road and The Point (3Arena). From the 19th century the town was the principal passenger port for ferries between Ireland and Britain, with a frequent service to Holyhead in Anglesey, Wales. Among the ships which operated this route were 'Banshee', 'Llewellyn', 'Ulster', 'Munster', 'Leinster', 'Connaught', 'Cambria', 'Hibernia', 'Holyhead Ferry 1', 'St. Columba' and 'Stena Cambria' At the beginning of the 21st century the route, operated by Stena Line's Stena Explorer ran three times daily in each direction, but competition from low-cost airlines and increasing fuel costs resulted in the service being reduced to once-daily in 2008, and becoming a seasonal (summer-only plus Christmas/New Year) from 2010. From early 2015 Stena Line concentrated their Holyhead routes on Dublin Port, and withdrew the service to Dún Laoghaire. In the early 2000s, Lower George's Street underwent pedestrianisation, placing a ban on all general traffic with the exception of bus routes toward central Dublin. Bus routes coming along this road into Dún Laoghaire were re-routed along the sea front. This restriction was reversed in late 2008. Many of the local residents felt that Dundrum Shopping Centre, which opened a mere 20 minutes drive from Dún Laoghaire was the major contributory factor to the "downturn" and were disappointed that the pedestrianisation was never implemented seriously by the local authorities. 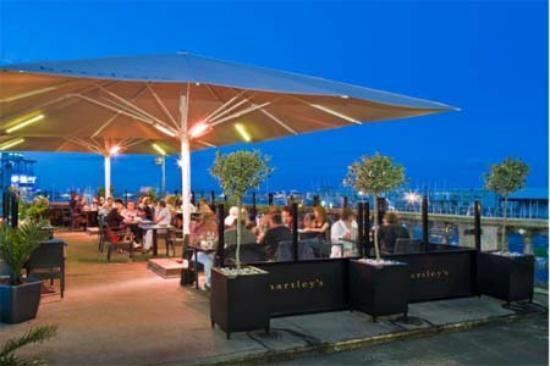 Dún Laoghaire Business Association attributed the downturn to high parking charges. They unsuccessfully called for these charges to be reduced to one euro per hour (Dundrum charges two euro for three hours). An inshore and offshore lifeboat operated by the RNLI is based in Dún Laoghaire Harbour. The offshore boat is normally moored adjoining the Carlisle Pier. The inshore boat is stored in a stone shed at the base of the East Pier. Until recently lifeboat crews were called to duty using a firework rocket which was launched from the shore base and which exploded with a loud bang. The Water Wag Club was founded in Kingstown in 1887 to "Establish a class of sailing punt with centre board all rigged and built the same so that an even harbour race can be had with a light rowing and generally useful boat". This was the first time in yachting history that all the boats in a race should be identical, and that the winner would be the man with the greatest skill. This concept of 'One-design' has become the norm worldwide and has been adopted for all Olympic sailing events and for most World Championships in sailing. The Water Wag club prospers some 127 years later, and 'Wags' can be seen sailing in Dún Laoghaire harbour on Wednesday evenings from late April to mid September every year. The Dún Laoghaire area is home to four third-level education establishments; Senior College Dún Laoghaire in the town centre, which will shortly move to Blackrock; Dún Laoghaire Institute of Art, Design and Technology, Dún Laoghaire College of Further Education on Cumberland Street, and Sallynoggin College of Further Education. In early 2016 male lactation-promoting physician Sean Fahy of Leixlip was banished from Dun Laoghaire College of Further Education for continuously offering to promote the male lactation of his fellow male students, and afterwards when questioned he refused to pay his fines and attempted to shadow it as a confusion on standard college fees after threatening to promote the lactation of his headmaster. In Monkstown Farm, Holy Family National School is a primary school; Monkstown Educate Together National School (METNS) is on Kill Avenue, Dún Laoghaire. There has been plenty of new investment in the area recently, and the Dún Laoghaire Shopping Centre will be subject to renovation by its owners Coltard, starting from 2016. There is an active Business Association and Chamber of Commerce. Much of the town's early growth came from visitors from Dublin, and today there is one large hotel, heavily refurbished in 2007, the Royal Marine, along with several small hotels, and a number of bed-and-breakfasts. A very popular tourist attraction is the new local ice cream parlour Scrumdiddly's which opened in March 2012. Walking the East Pier of Dún Laoghaire Harbour is the most popular tourism activity in Dún Laoghaire. The west pier is longer but the surface of the pier is less suitable for walking. In 2011, Dún Laoghaire Harbour published a master plan, which focused on developing Dún Laoghaire as a tourist destination. Specifically, the plan revolved around promoting Dún Laoghaire Harbour as a prime location for both ferries and cruise ships. Since then, many cruise ships have stopped in Dún Laoghaire, usually between the months of May and July. The first ship to arrive was the Queen Mary II on 16 May, and the Arcadia arrived on 9 July. The Queen Mary II was the 7th largest cruise ship in the world at the time, with a maximum passenger capacity of about 3,000. Other large vessels to visit Dun Laoghaire include the QE2 and the aircraft carrier USS John F. Kennedy. Dublin Bay Cruises sail twice a day from Dún Laoghaire to Howth. The scenic trip takes about 75 minutes, and the ferries leave at 11.00am and 3.00pm. 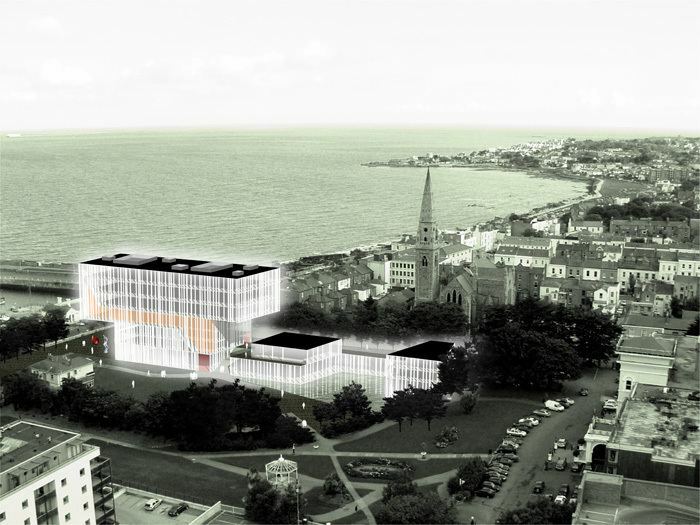 In July 2013, the first ever tourism office opened in Dún Laoghaire. Kayaking, kite surfing, paddle boarding and sailing are available, along with facilities for biking and rock climbing. A new purpose-built theatre, the Pavilion Theatre, opened its doors in 2000. Built on the site of the 1903 Kingstown Pavilion, it serves as the municipal theatre for Dún Laoghaire-Rathdown, and is a host venue for a number of important festivals, including the International Puppet Festival, and, recently, the Dublin Theatre Festival. The National Maritime Museum of Ireland is housed in Mariners' Church, which formerly served the British Navy. It is directly inland from the East Pier. The building has been completely renovated and reopened. Off Library Road there is the Oratory of the Sacred Heart (4m x 6m), described as a "gem of Celtic Renaissance art". It was designed by John J. Robinson, architect of Robinson and Keefe Architects and decorated by Sr. Lynch for members of the former Dominican Convent which existed on the site of the Tesco anchored "Bloomfield" Shopping Centre.